Tim Streeto, ACE is a film and television editor whose recent credits include Netflix’s “Maniac,” Amazon’s “The Marvelous Mrs. Maisel,” Director Marc Webb’s “The Only Living Boy in New York,” HBO's series “Vinyl,” WeTV's “South of Hell,” the Emmy-winning “Boardwalk Empire,” NBC’s “Crossbones,” and Noah Baumbach's acclaimed feature films “Frances Ha,” “Greenberg,” and the Oscar-nominated “The Squid and the Whale.” His past film credits include Terry Kinney's “Diminished Capacity,” Steve Conrad's “The Promotion,” Craig Zobel's “Great World of Sound” and Robert Pulcini and Shari Springer Berman's “American Splendor.” He also worked as an assistant editor on Ang Lee's Oscar-winning “Crouching Tiger, Hidden Dragon,” Todd Solondz's “Storytelling,” and Steven Soderbergh's “Solaris,” among others, and has edited numerous shorts and shows for Comedy Central, A&E, Starz, Nickolodeon, and the History Channel. The post-production industry is highly competitive, and knowing the industry standards – Premiere Pro, After Effects and Avid Media Composer – is critical for success. MEWShop offers in one comprehensive, six-week course all of these editing applications, taught by certified instructors. No other program guarantees more time in the classroom or more working on one’s own computer. The Six Week Intensive Course will take students through each program as they work on various real-world projects to illustrate the distinct strengths and nuances of each NLE. MEWShop’s Six Week Intensive is also the only course of its kind that allows students to choose the footage they want to edit on the platform they prefer. Beyond the creative and technical aspects of editing, a portion of the Six Week Intensive Course also is focused on the best strategies to secure a job once the class ends. Students will draft cover letters and resumes, which will be refined over the span of the class, and also discuss with instructors interview strategies and job applications, as well as how to appropriately set rates and find the right work for each graduate’s unique interests. 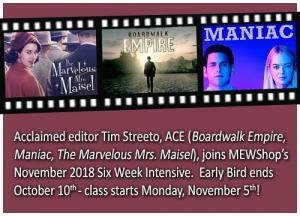 The next installment of MEWShop’s Six Week Intensive Workshop begins on November 5th, 2018 and held Monday through Friday from 10AM – 5PM. Students can get $350 off this class if they sign up before October 10th. For more information on MEWShop’s Six Week Intensive Workshop or to register, please visit: https://www.mewshop.com/six_week_workshop/overview/.